Open Space Technology is one way to enable all kinds of people, in any kind of organisation, to create inspired meetings and events. Over the last 20+ years, it has also become clear that opening space, as an intentional leadership practice, can create inspired organisations, where ordinary people work together to create extraordinary results with regularity. 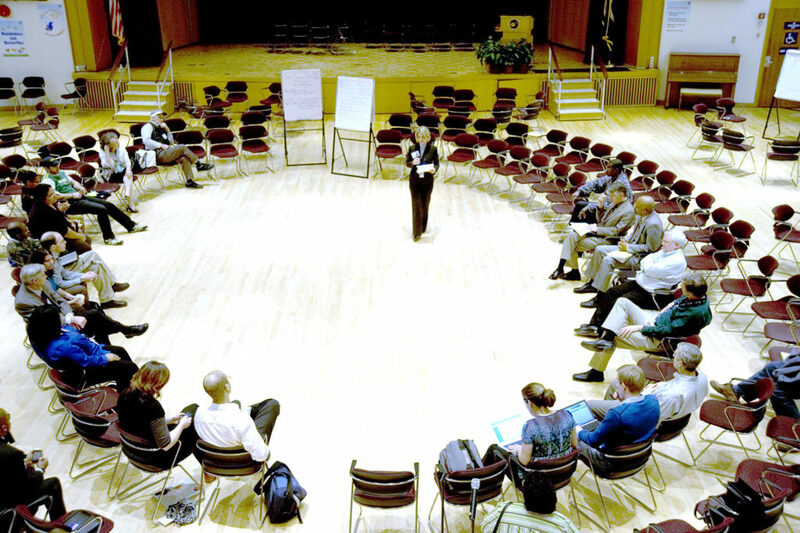 In Open Space meetings, events and organisations, participants create and manage their own agenda of parallel working sessions around a central theme of strategic importance. A number of areas are set up and labeled to serve as “topic areas”. These can be separate rooms, corners of the same room, or really any space that allows for discussion and collaboration. Topics are proposed by participants (anyone can propose a topic), with a short description, and assigned a time slot and a topic area. This step is repeated until there are no more topic suggestions or all the slots have been filled. The unconference starts proper, and all participants go participate in the topic that interests them the most. Whoever comes is the right group. If, during the course of the gathering, you find yourself in a situation where you are neither learning nor contributing, use your feet and go to some more productive place.